Twelve-year-old Patryk knows little of the world beyond his tiny Polish village; the Russians have occupied the land for as long as anyone can remember, but otherwise life is unremarkable. Patryk and his friends entertain themselves by coming up with dares — some more harmful than others — until the Germans drop a bomb on the schoolhouse and the Great War comes crashing in. As control of the village falls from one nation to another, Jurek, the ringleader of these friends, devises the best dare yet: whichever boy steals the finest military button will be king. But as sneaking buttons from uniforms hanging to dry progresses to looting the bodies of dead soldiers — and as Jurek’s obsession with being king escalates — Patryk begins to wonder whether their “button war” is still just a game. When devastation reaches their doorstep, the lines between the button war and the real war blur, especially for the increasingly callous Jurek. Master of historical fiction Avi delivers a fierce account of the boys of one war-torn village who are determined to prove themselves with a simple dare that spins disastrously out of control. 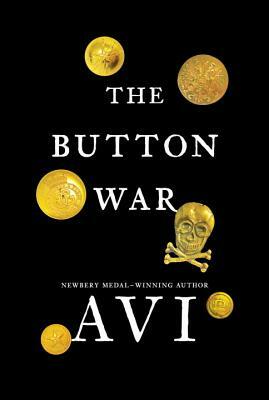 Avi is one of the most celebrated authors writing for children today, having received two Boston Globe–Horn Book Awards, a Scott O’Dell Award for Historical Fiction, a Christopher Award, a Newbery Medal, and two Newbery Honors. He lives in Colorado. Told from Patryk’s point of view, the novel captures the ways that war can forever alter a child’s sense of order, morality, and security in the world. Strongly visual scenes, including the smoky forest after battle, the soldiers marching in perfect formation, and a chilling final image of Jurek, will long resonate in readers’ minds. Avi has written a compelling and tautly constructed book that is a portal to grappling with the complexity of the human instinct to compete. Highly recommended. Although some readers will simply hang on the drama of Avi’s simple and unnervingly tense plot, most will recognize this as a powerful anti-war allegory...The final scene in which “winner” Jurek crows in triumph that he’s “Jurek the Brave! King of everything!” over a ruined and emptying village hauntingly exposes the universal vacuity of bullies and their enablers, whether in middle-school hallways or on a battlefield. The award- winning Avi has turned in another solid performance, bringing history alive with a clever plot, a powerful, anti-war theme, and characters as memorable as his story. Fans of The Lord of the Flies and readers ready to plumb ambiguity will respond to the dark themes...Bleakly demonstrates that war, no matter its scale, is devastating. Avi’s short, staccato sentences read eerily like troops crossing the page, building dread with every chapter, leading inexorably to tragedy. Readers are left with the consequences of one boy refusing to speak up and thus allowing an unstable leader to run amok. In this arresting, unsettling novel for 9- to 14-year-olds...the author is so sparing with description and language, and the lines of dialogue are so clipped and abrupt, that the story feels both real and like a dread allegory. Possibly [Avi’s] finest work yet, The Button War is a classic.